It’s a very long way from the small town of Marshall, Michigan, to the breathtaking stark isolation of the Peruvian Andes. Marshall is where Eric Ebner ’11 (BA) has his roots, raised by an attorney mother who worked for the county representing abused and neglected children, and a physician father who took each of the Ebner boys on a mission trip for his 16th birthday. That mission trip left such an impression that he went on to major in Spanish at USD, with a minor in visual arts. 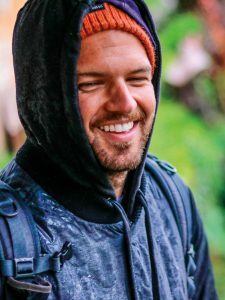 Last spring, he quit his job at a medical device company and teamed up with his brother, Aaron, who co-founded the Andean Alliance for Sustainable Development and has been living in Peru since 2009. 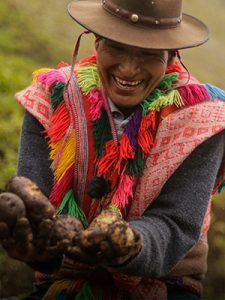 They raised $10,000 through a Kickstarter campaign and produced a stunning documentary film about a legendary potato farmer, a tiny indigenous enclave nestled high on a mountainside amid the clouds, and a precious way of life that could soon be lost. Via sweeping vistas of the snow-capped Andes and visuals so rich you can almost feel the texture of soil sliding through your fingers, Opening the Earth introduces us to Don Julio Hancco Mamani of Pampacorral, a weathered man with a mouthful of silver, revered in his community as the Potato King. “To be honest, I don’t even know if he knows how old he is,” Ebner says. “He can’t read or write. He can barely speak Spanish.” Julio and his neighbors speak Quechua, an ancient dialect used by the Incas for thousands of years. They live in adobe huts they built themselves, with no electricity. Don Julio’s water supply flows down the mountain and into his house through a makeshift piping system. His wife Rosa weaves the colorful traditional clothing his family wears, and they subsist mainly on a diet of potatoes, chicken, lamb and guinea pigs. Their way of life is ancient and the mountain climate is punishing. Julio didn’t set out to become a world-renowned potato farmer, but his almost magical knack for evaluating soil and developing successful new species at various altitudes made him famous among mountain communities. Over time, he sextupled the 60 varieties of potato that his father had left him to more than 360. Word of his agricultural aptitude reached Moises Quispe Quispe, who had also grown up in the mountains, but had gone on to earn a PhD and head a non-governmental organization dedicated to promoting and developing indigenous farming communities in the Andes. “You can have endless degrees, but if you don’t know the land, you don’t know its environment,” he says in the film. With Quispe Quispe’s help and encouragement, Julio began traveling to city markets and entering his eye-catching produce in local contests. He always placed first. “I developed much motivation to make something out of this ambition,” he says. Meanwhile, most of his six children left the mountains, the farm and the traditional way of life, more interested in earning money and finding material success than in safeguarding their legacy. Only one son — Hernan — sought to perpetuate it; not by farming, but by making potato chips. For three years, he scraped by in a two-room apartment in Peru’s capital city, Lima, sleeping on one side of the wall and slicing and frying potatoes on the other. Hernan’s lucky break arrived when Quispe Quispe invited Julio to participate in a slow food festival in Italy. He wasn’t allowed to import raw potatoes, so he brought his son’s richly colored thick-cut chips instead. They sold out in two hours, and Julio took home 2,000 euros. That’s when he began to truly appreciate the monetary value of his produce, Quispe Quispe says. And Hernan’s potato chip business took off. Finding a modern outlet for an ancient way of life might well be the key to sustaining it. But why we should worry about sustaining someone else’s tradition is a profound question that Ebner’s film, with its soaring beauty and evocative imagery, endeavors to at least try to answer. For one thing, he argues, Julio’s varieties could potentially save the planet from another catastro-phic potato famine. 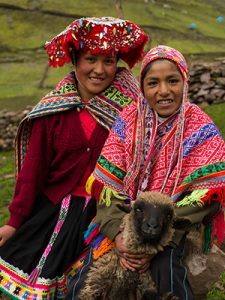 In truth, there’s an idea that’s even bigger here, something that surprised both Ebner brothers as they got to know Peru’s indigenous farming communities more intimately. It has to do with our society’s narrow definitions of poverty and happiness, and whether a genuine desire to help may actually be misguided. Listening to others and learning from them was what Eric seemed to do naturally as a student, says Andy Cross, a lecturer in the Visual Arts department who taught Ebner photography and new media and has kept in touch with him since. He remembers Eric as an old soul, sincere and genuinely interested in what his classmates had to say. Martinez Veliz, co-owner of the internationally renowned Central Restaurante in Lima, uses them in his cutting-edge menu, which features and promotes indigenous Peruvian ingredients. A meal at Central costs hundreds of dollars and reservations are taken months in advance. But despite his growing fame and success, Julio’s life in the Andes remains simple. You can almost smell the fresh earth and feel the rough skin as the camera catches him gripping handfuls of freshly picked potatoes, showing off their widely varying shapes, hues and shades. The Ebner brothers are hoping their movie persuades at least some viewers that cars and houses are not what make us happy, and that cash is not what makes us rich. 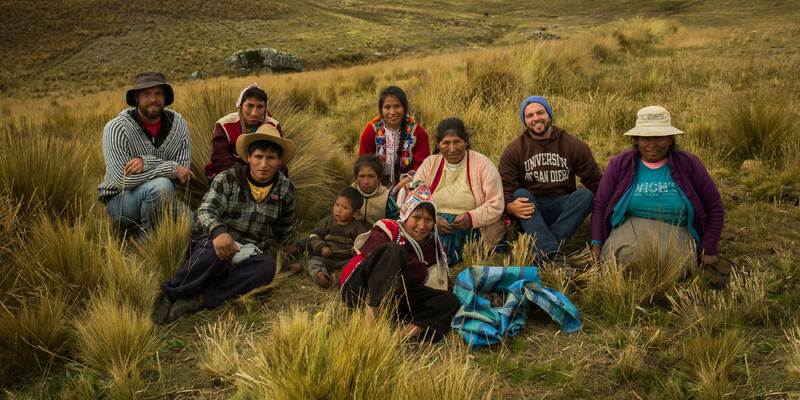 “As I was in Peru, I really began to look at these people as role models,” Eric says. “They have everything they could ever want or need right at their fingertips. Friends, family and purpose. If we adopted more of their values and mindset, we would be a more well-rounded and happy culture ourselves.” It’s a message he believes will resonate with anyone who sees the film. And if it inspires audiences to make even small changes in their own lives, he’ll be pleased. After spending months in the mountains, immersed in Julio Hancco Mamani’s family, community and existence, Eric Ebner is most eager to hear what the star of the film thinks of the finished product. To learn more, go to alianzaandina.org/opening-the-earth. Photography courtesy of Eric and Aaron Ebner and the Andean Alliance for Sustainable Development.